I have never taken on a challenge like this before. Each day that Run Iceland 2018 gets closer this becomes more apparent. Some days I feel I’m on top of this and on others worries race through my brain. To bring you all up to speed…after a couple of mulled wines at Christmas I agreed to run Iceland this summer. This means an east to west run across the country. Not something we can find many people having done before and for good reason. There isn’t much in the centre of Iceland except hills, volcanoes and strong winds! We have booked our flights and are heading out on June 2nd. You can read more about my previous Iceland trip and my teammates here. Which bits am I on top of? Physically, I am feeling better than I have for a good while. A combination of lots of running, swim training for Swimathon and the odd bike ride are keeping me busier, happier and fitter than ever. My hip played up on a trail marathon a few weeks ago but I know that was my fault for neglecting strengthening exercises. Now I’m back to lunges and squats a few times a day and that should put the pain back in its corner. I have bought some kit! Mainly I have got very good at researching and procrastinating but occasionally I have taken the leap and made a purchase. I’m very happy with my bivvy bag, an Outdoor Research Helium. For those who don’t know a bivvy bag is like a mini personal tent. I chose a super light hooped one. Hooped bags are great because the material is held away from your face, meaning they feel more roomy. This was super important to me as I will there won’t be a lot to do in the evenings except chat and rest. I also bought my back pack, a Montane Ultra Tour 40l. Again super light and hopefully with enough capacity for all my sleeping gear etc. and 17 days worth of food. Having the pack has allowed me to start running with weight on my back. Having listened to advice (some good and some bad!) I am finally getting comfy with it. 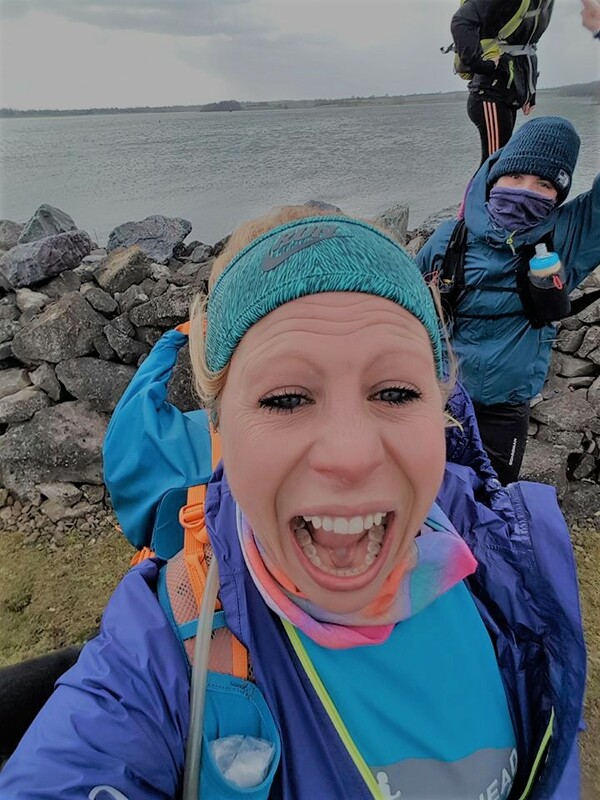 It’s tougher to get going when you haul a pack on but I have enjoyed the experience and seem to be developing legs of steel (razor sharp calf muscles Jo Clarke – sorry best friend joke!). Five of us are heading out on Run Iceland 2018. Four of the gang met today for a run and planning session. The conditions were pretty brutal. It was possibly the coldest I have been while running. The wind was blasting horizontal snow at us at up to 40mph (that can knock you about a bit with a big pack on!) and numbed our faces and legs. But we laughed. We laughed most when the weather was worst and that filled me with joy. Because we are going to have tough times out there. So long as we can keep laughing, with and at each other, we can keep running. Post-run we retired to the pub and crowded round the open fire with maps. Lines were drawn and discussions were had. Google maps showed us that roads on the map were really dirt tracks and that was fine with us. The bits where the dirt tracks run out…well they are the ‘winging it’ bits. Questions such as; ‘is that a quicksand/lava field/sandstorm area?’, ‘how close can we go to that glacier?’ and ‘would we be better going around or over that?’ came up often. Some intense measuring revealed the true distance we would need to run; 494 miles. And we want to cover that in 17 days. Gulp. Did you read that last paragraph?! 494 miles. In 17 days. It’s doable but it means covering around 30 miles a day. We are going to have to dig deep and it will hurt. Those who know me know I have a ‘work less, play more’ attitude to life. I choose to work less than full time hours so that I can get the very most from life. In doing this I sacrifice a certain amount of money. And yes, I know how damn lucky I am to be able to choose this. This evening I sit and blog, a happy dog and glass of wine beside me, having had a wonderful day out with friends enjoying the freedom of the countryside. I cling tight to the balance I have in my life but it means I think about money a lot. My parents have been great and a friend has been a huge help by offering to lend me some gear, as well as furnishing me with excellent advice. There is still a fair old bit of kit to be bought for this trip and I am using my online bargain hunting skills to the full. It will all come together and I just keep chipping away at that shopping list. The biggest worry though is failure. If we plan everything meticulously and something outside of our control stops us I can just about live with it. If we fail because we didn’t plan properly I will struggle. That’s why days like today are so important. Talking face to face, rather than online, gives us all a chance to get things clearer. There is still much planning to be done, such as how we will get across the country to our start, but we will keep chipping away at that too. So, here’s to Iceland; to getting stronger, both in body and in plans. Here’s to adventure, to pushing our limits and loving every challenge. Here’s to appreciating the joy that life can bring and laughing at the wind in our faces.